Set in Torremolinos, this hotel is attractively decorated with bright and spacious public areas. An extension and partial refurbishment has now been completed. Although this hotel has been rebranded since our visit last year we were once again not at all disappointed. The hotel has been refurbished, painted and generally done up since becoming part of the RIU family. A lot of the staff are still the same, as is the Management. They all recognised us from the previous two years we have been going. The only change we noticed is that at evening meal time. There are now two sittings but that did not bother us in the slightest. It just meant that we went down for our meal between 6.30p.m and 7.oop.m. We used to go down at this time in the previous years. Upon arrival at the hotel you are now greeted with a glass of fizzy stuff or orange juice. A nice touch by the new owners. Check in takes minutes and not for ever which is what I love about this place. The entertainment still leaves a lot to be desired if you are under fifty! However we don’t go for the entertainment. The food was again perfect, with a great choice once again for all three meal times. We are looking to book again next year. I travelled with two friends for a week All Inclusive at Costa Lago and it was a return visit for my friend but my first visit to this hotel. I was not disappointed in any way. The hotel bedrooms were spotless and cleaned every day with fresh towels. The dining room and bar staff were very welcoming and very helpful and pleasant as were the staff at reception. The food was excellent with a great choice for all appetites. Overall the staff were 100%. The pool area was lovely, a little small but was kept very clean with a life guard attending all day. Tea and coffee available at pool bar as well as other refreshments. Overall this hotel including pool area has a very high standard of cleanliness. The Hotel location was perfect to the beautiful beach and a short walk to the Promanade that goes on for miles. Entertainment was low key here but a short distance away there was plenty going on with a wide range of pubs and clubs within walking distance. I really enjoyed my trip to Costa lago and hope to return again in Sep/Oct for another week. I have already recommended it to my friends and they hope to visit Costa Lago on a return visit with me. We returned to this hotel again, and once again we had an enjoyable holiday. We were told that the hotel has been taken over by RUI and will be re-branded and refurbished over the next 12 months. Work has already started on some rooms and we only knew because we saw workmen, but there was no noise or disruption. We have already decided we shall be returning next year. Food rating in First Choice brochure was not very encouraging but research on the internet indicated this had improved. We already knew the location having stayed in the area previously so decided to book. We were not disappointed in any way. Food was good and much was cooked in front of you. The diet took a bit of a knock. The hotel was clean, and the staff made everyone feel welcome. One gripe was the afternoon snacks. Limited and could do with someone in attendance as dirty plates tended to accumulate. Entertainment was nothing special but we met lots of nice people so it made no difference to us. The bar staff worked their socks off but just wish they did not put so much ice in. Rooms vary in layout. We had a superior room so had a separate lounge area. I cannot comment on the others. Cleaned daily with fresh towels. Getting out and about was easy with half hour bus service outside the front door. La Collino railway station just a 10 minute walk away. Important points to note. Hairdryers in room. Safe costs a 10 euro deposit only - ask for a key when you book in. No day time entertainment/activities (might be time of year) but we were out every day so did not bother us. Will we be going again? Yes! We read varying reports on the web about this hotel. All I can say is the food was excellent, with plenty of choice, and always hot. 95% of it is cooked in front of you. We had two rooms. One for three and the other for two. Both rooms were big enough with plenty of space for clothes, suitcases etc. Balconies had table and chairs with plenty of space for sitting out. We had a room overlooking the pool. The location was great. Thirty minute walk along the sea front to Torremilinos town centre, or the number two bus outside the hotel. Staff were excellent and worked hard all the time. Rooms were cleaned every day and clean towels every day if required. They asked you to use them more than once, and then to throw into the bath when they needed changing. The entertainment was not the best, but we did not go for that so it never bothered us at all! Would we return to this hotel? YES we have booked to go again next February. Stayed All inclusive at the costa lago,supposed to be 4 star but i would only rate as a three star. This Hotel is ideal if you are looking for a quiet hotel with no enterainment and you are over the age of 65. Not a hotel for a family with teenagers they will be bored. Having just returned from a lovely stay at the Luca Costa Lago Hotel I wished to express my views about the previously negative views about this hotel. My family and I, two adults and two children, had a excellent stay at this hotel and everything we could have possibly wished for was on offer to us. We chose the All Inclusive basis which, unlike previous views, we found lovely, the wealth of food and drinks available was fantastic - we were spoilt for choice. The room was clean, tidy and spacious. Maid service was provided each day and towels / linen were changed whenever we thought fit. The maids were very friendly and we did our best to speak in their native language which they really thought well of. The hotel staff were very friendly and always willing to help whenever asked. This we believe is always essential to any part of a holiday and the staff made sure to follow. Entertainment was above average. Yes, there were days when the entertainment lacked enthusiasm. However, seen as it is not the hight of the season we did not find this a problem. On occasional nights, we visted a lovey bar a short stroll from the hotel which was fantastic. The bar offered a wide range of entertainment and music until the early hours of the morning. The hotel surroundings were delightful. 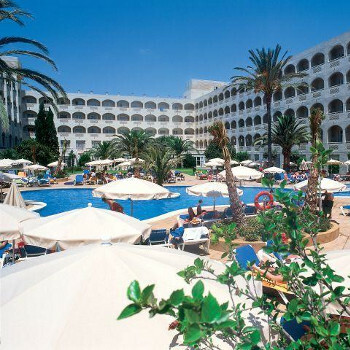 Lovely big pools, lushous green scenery and bar, shops and restaurants metres from the hotel. Would I return to this hotel? Most definitely! A lovely stay which next time we return to Malaga will be our number one choice of hotel. Previous views - were you staying in the same hotel?! I have recently returned from a lovely stay at the Luca Costa Lago hotel. On this occasion, I decided to take my chances and not read the reviews before I went. However, after returning to Britain I was utterly shocked by the what could only be argued as mistaken reviews. This hotel is suitable for all age groups - young and older adults, teenagers, couples and families. I would definitely agree with the 4* rating of this hotel as they matched every criteria. Room was spacious and very clean. Yes, there were only two channels in the English language but who really goes on holiday to spend their stay in the room? The hotel itself is superb and you can see that the hotel staff really take pride in keeping the hotel clean and tidy. As it is in the winter months of the year, the weather was mild and luckily there was no rain. However, the staff endeavoured to maintain the adult and children entertainment. Moreover, the pool was cleaned and heated throughout the day which is far more comforting than stepping into freezing cold water. We decided to opt for the All Inclusive option and this proved to be the right choice. For breakfast, lunch and evening meals, the hotel offers a wide variety of cold and hot servings. We were really impressed by the vast range of food - a wide choice of meats and fish products, deserts and children options etc. Also, there was a large range of snacks throughout the day. Drinks - alcoholic and non - alcoholic were served throughout the day / night. It would be hard pushed to find something this hotel does not offer. The staff were delightful and always willing to help whenever needed. It is great to be able to speak Spanish fluently as you feel you are respecting the language / culture as some Brits do not. The location of this hotel is superb. Just a short stroll from the beach (150 metres) and close to restaurants / bars / shops etc. There is a local bus and train service to neighbouring resorts and transport is pleasantly cheap. I really enjoyed my stay at this hotel and have now booked my return stay for July 2010. I am so glad that I did not read the reviews before booking as this hotel is excellent and completely fautless! Arrived on December 21 for 12 night stay. the hotel was clean and tidy but not inviting.the room although split in two was not very big and had minimum facilities E.G television with only 2 english channels both of which were news channels,no tea or coffee facilities and very limited bathroom extras such as soap and shampoo. the beds were not very comfortable. Just returned from an A/I week's stay in Luca Costa Lago. Hotel very clean, room cleaned daily. Hotel dated compared to 4* star hotels we have previously stayed in in Canary Islands. Food dire. Bar needs to be sorted out if A/I, only drink you can get is pool bar, not good if raining or weather not good. No fridge in rooms which considering it is rated as 4* I have never experienced in the canaries. Hotel staff very nice which I suppose makes up for some of the bad points. Very relaxing enjoyable holiday but would not return due to the lack of standards we have previously experienced. Definitely not a 4* in our opinion but maybe because we are used to better. Saying that we had a good holiday but not cared for the English.